The Zante Plaza Hotel sits proudly on the coast of the Greek island of Zante, in the Ionian Sea. It is an ideal location for couples and families looking to have a relaxing break against the idyllic backdrop of the Mediterranean Sea. Zante Plaza Hotel & Apartments Guests checking into the 3x000D star Zante Plaza Hotel & Apartments in Zakynthos are assured of a warm welcome. Off site car parking is available. Guests can enjoy a meal at the hotel restaurant. Room Facilities Zante Plaza Hotel & Apartments. All rooms have a hairdryer. Smoking is permitted in both the bedrooms and the public areas of the hotel. Please specify when booking. All rooms have tea and coffee making facilities. Leisure Info. The Zante Plaza Hotel & Apartments offers a range of leisure facilities. A luxurious range of spa treatments including beauty, massage and sauna is available. Hotel guests can relax in the hotels outdoor swimming pool. Additional Info. The hotel offers an airport shuttle service. Pet owners and their well behaved pets are welcome at the hotel. Hotel guests can make use of the concierge service that is provided. 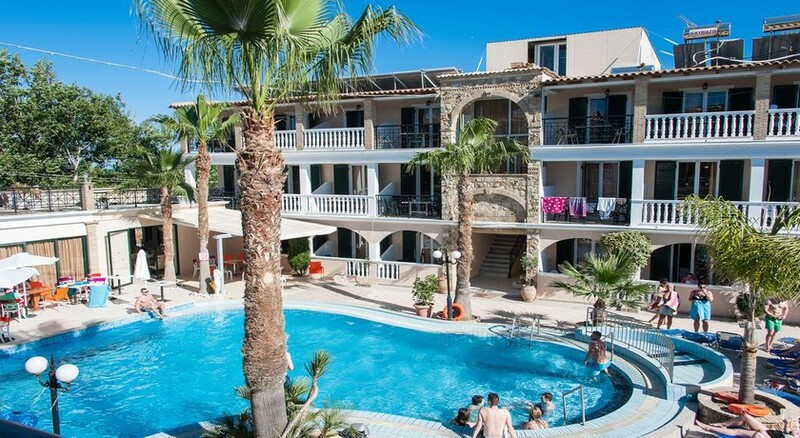 The Zante Plaza Hotel would be a strong holiday choice for couples and families who want versatility from their holiday. Here you are ideally positioned to visit the beaches during the day, and the town by night. However, the hotel has sufficient facilities for you to stay put for a few days and still have a fantastic time! There is an outdoor pool for you to swim in and sun-loungers to dry off on. The hotel also boasts a Jacuzzi and sauna if you really want to cleanse those pores after a good swim under the Mediterranean sun. Accommodation is made up of a combination of studios and apartments fitted with private bathrooms, TV, balconies and the all-important air-conditioning. You can run the gamut from self-catering to all-inclusive, depending on your holiday culinary requirements.Other facilities within the hotel include a beauty salon, laundry service, Wi-Fi in public areas and a currency exchange desk. The hotel even holds a wedding license if a Greek wedding is on the cards! The Zante Plaza Hotel features a restaurant that serves breakfast, lunch and dinner as well as those all-important snacks during the daytime. There is also a bar in which you can relax with a drink and reflect on a day well spent. The Zante Plaza Hotel is situated within the resort of Laganas. Laganas is celebrated for its vibrant and lively atmosphere. It is full of clubs, bars, tavernas and restaurants, in which it is possible to enjoy the full flavour of a Mediterranean summer.If you dream about reclining on a white sand beach while a translucent blue sea laps against your feetâ€¦ then this is the place for you! If youâ€™re careful you may even see some of the protected loggerhead turtles who nest in this area.The island capital of Zakynthos is only a few kilometres away, if you fancy visiting more traditional tavernas or the famous port.